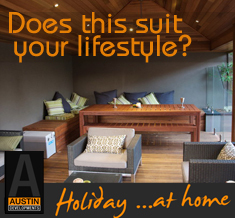 Austin developments are Perth premier timber decking and screen artisans, specialising in more challenging architectural designs. 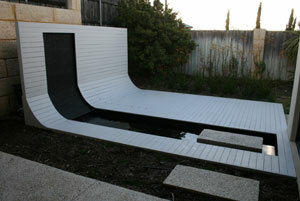 This particular curve decking and screening was a design the client came up with which sees the transition of the painted timber decking roll up into the timber screen which has a water feature recessed into it , that flows down to the coy pond below. Making any square product bend , curve , round is always a challenge and has been successfully executed here to finish this project we called the “Skatey Ramp”. Painting the timbers an off white colour confuses the eye on whether the materials used are timber or fabricated steel, and lends itself to the desired clients theme and taste.